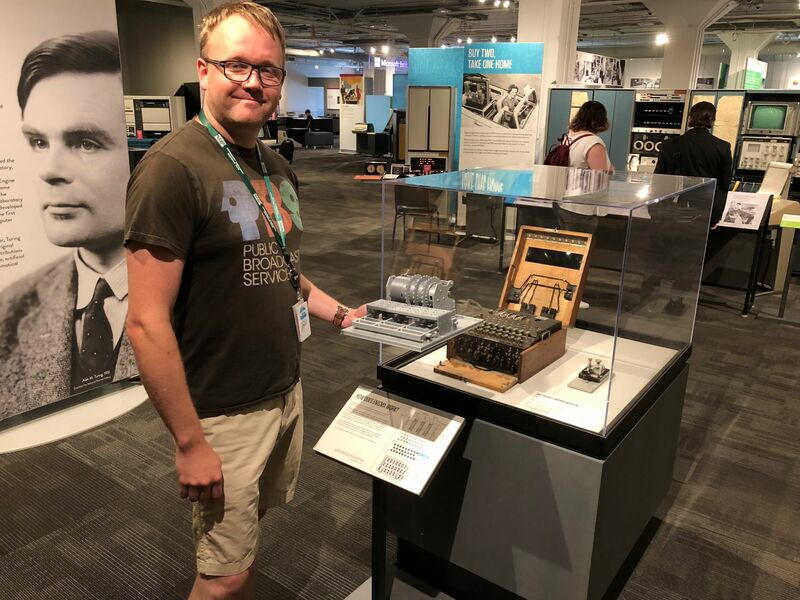 Hi all – I’ve not had a ton of time recently to update the Enigma machine, so here’s a quick rundown of where I’m at. Keep reading for something really cool. Modeling: mostly done. I think I have pretty much everything modeled at this point with the exception of the individual keyboard keys. Printing: mostly done. I think I have everything printed that I’ve modeled so far with the exception of one really large piece I’m trying to decide how best to split and print. Assembly: 50% done. I’m trying to figure out how best to deal with some of the threaded parts, as my tap/die set leaves about 2mm of unthreaded surface when cutting down to a step. May fall back to switching some of these parts to friction-fit rather than screw-in. Mechanicals: I need to learn to make springs. The Enigma has several types of springs: extension, torsion, and compression, and they all have different nuances to making them. 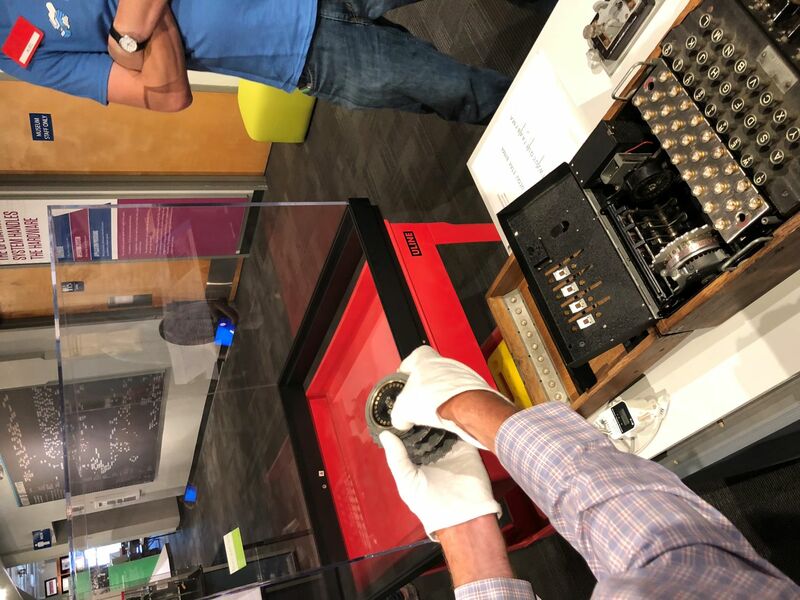 So, a few weeks ago I found out the Living Computers Museum + Labs in Seattle has an M4 Naval Enigma on display. I visited the museum a few weeks back, and got introduced to their executive director, Lath. I shared via email with him some info about my project, and then found out they actually bring their Enigma out from the climate-controlled confines periodically to demonstrate it to visitors. I asked if I could bring my in-progress assembly down and was told yes! Well, today I skipped out of work midday to bring my parts down to compare, and took my good friend Jeff who documented the whole thing in photos — I was too giddy to take my camera out! 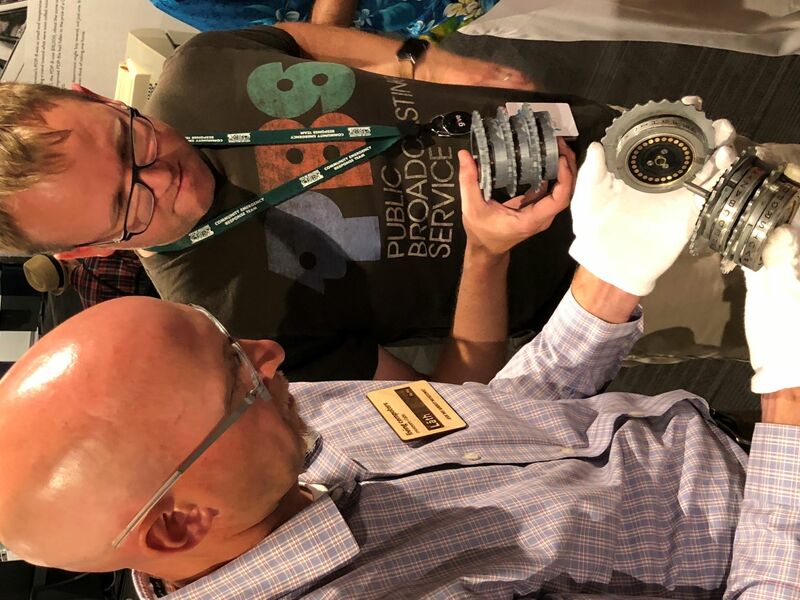 Lath was kind enough to open and remove the rotors from their Enigma (they had never actually done that since acquiring the fully working machine!) so I could see some of the innards. The good news is my reproduction looks pretty spot-on, with the exception of some of my color choices for printing. I may re-print some of my machine parts to better match the museum’s specimen. M4 Enigma nylon rollers are screwed and bolted in place, while the M1 had pins that screwed directly into the roller arms. It was pretty amazing to watch the machine operate and be set up. The mechanics of how it moved were so tactile and smooth, which is impressive for an un-restored 70-year old machine. German engineering, as they say. I’m pointing at something, but no idea what! Massive thanks to Lath for making my day and letting me explore the Enigma a bit and compare my parts with the real thing. What an amazing experience. He asked that I keep him posted on my progress, so as I get the mechanicals working more I hope to bring the machine back down to the museum in the future. Posted bymarius July 24, 2018 July 26, 2018 Posted inEnigmaTags: enigmaLeave a comment on Enigma update coming soon! One of the first things you need if you decide you want to 3D model anything is relatively accurate measurements. If you want to 3D model something with gears, interlocking parts, that functions – you need very specific measurements. Finding Enigma material on the internet is like stepping back to Geocities webpages from the early 2000s. So I sat stuck for a while. Meanwhile, I had seen a few Enigmas in museums. I wondered if I could get my hands on one. This exhibit showcases possibly the most well-known of all cipher machines – German Enigma. It became the workhorse of the German military services, used to encrypt tens of thousands of tactical messages throughout World War II. The number of mathematical permutations for every keystroke is astronomical. 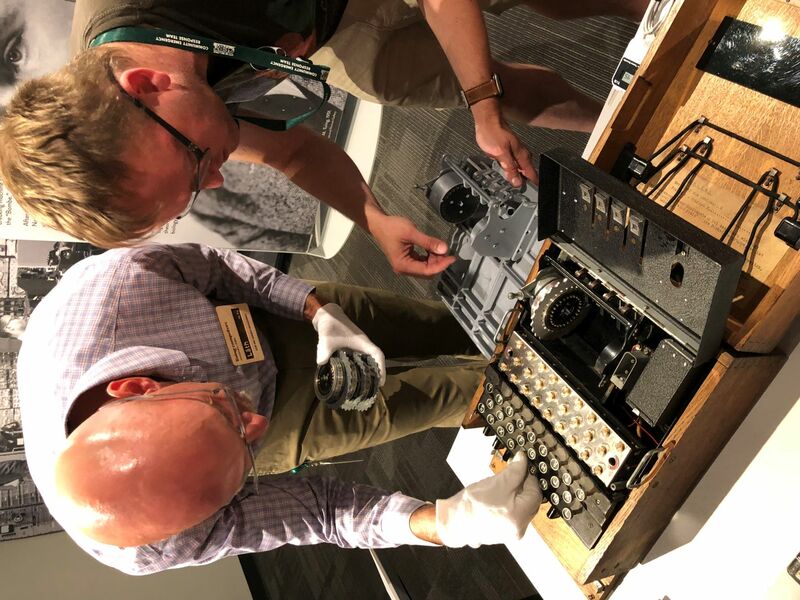 Allied forces were able to read most of the Enigma encrypted messages throughout most of the war as a result of the tireless effort of many Allied cryptologists. It is an electromechanical machine that used a combination of wired rotors and plugs to change each letter as it is typed. Today, many historians believe that the Allies’ ability to read the Enigma-enciphered messages and act on that information shortened the war by as many as two years, saving thousands of Allied and Axis lives. If not, would they let me … come take it apart and measure it? Yes, you read that right. I sent the NSA a message on Facebook. I’m certainly on some sort of list now. Yeah, this was a pretty naïve thing to ask. For one, OF COURSE THEY WON’T LET ME TAKE APART AN ENIGMA. The second reason: while I do own a bunch of calipers, I had no idea at the time how many little parts are included nor do I know how to accurately dimensions and understand tolerances of parts. I guess I should have paid more attention during the Industrial Engineering and Engineering Graphics/Design courses I took in college. The NSA guys were pretty awesome: they responded quickly, explained it hadn’t been dimensions and ignored the second half of my question. So, of course, I responded again and asked if I could fly out there and measure it. The answer, as one might expect, is .. again to remind me they don’t have blueprints and ignore my request. 🙂 However, this time they suggested I talk to the Enigma-Replica.com guys because their website says something about AutoCAD Drawings. So, I hadn’t noticed AutoCAD Drawings mentioned before, and sure enough, there was a AutoCAD logo buried on an image on the website. I emailed Jim, the site owner of Enigma-Replica, and asked him if AutoCAD files were available, and that I was willing to pay for them if so. This conflicted me a bit — if someone provided AutoCAD files, I wouldn’t need to learn to model, but at least I could start printing parts of an Enigma machine! Jim responded within a couple of days saying that they don’t have AutoCAD files available, but why not just download the mechanical drawings from the Enigma Nachbauprojekt website. I hadn’t heard of this site, browsed over it rapidly, and found a PDF for the rotors, reflectors, and rack! HOLY CRAP! DRAWINGS! FREE! AND THEY ARE GLORIOUS. It looks as though these drawings were done by someone that’s well versed in mechanical engineering or industrial design, and I found this reference handy for deciphering the drawings. As best as I can tell, this site was done by a team in Germany back in 2003 when they were creating an authentic replica of an Enigma. The measurements are amazing: properly toleranced, all the radiuses and chamfers defined, and properly laid out. There is absolutely no way I could have accomplished this myself given many days and all the calipers in my collection. This was an awesome resource that I hadn’t found. Why? Because in all my research for Enigma collateral, I was searching for things in English only. Turns out, there are several sites in German that document these things well. Hindsight is 20/20, no? 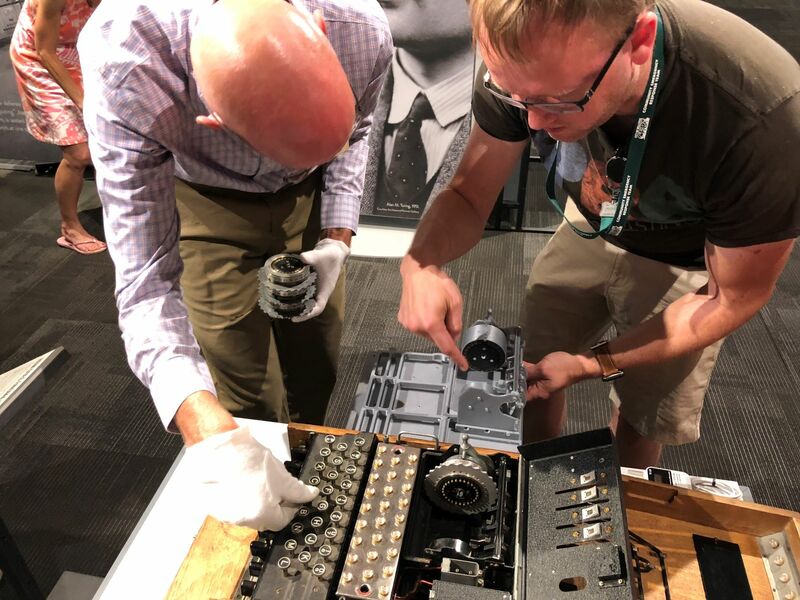 Why print an Enigma machine? Why do I want to print an Enigma machine? I think some background on me is important here. I’m not one of those people that can read a book and learn something useful. I have to be able to apply it. As most of you know, I work at Microsoft – and while I took some programming classes in college, I never really was able to pick up programming. I’ve tried a few times: grabbed a book one the programming language flavor of the month, try some code, and fail miserably. I’ve taken some interactive courses through places like Codecademy, which make you apply a project.. and it doesn’t stick. The example projects are abstract, irrelevant, and uninteresting to me. I don’t care to program a game of Battleship. What I need is to build something that I’m interested in. It pulls me in, and I can then learn. Unfortunately, there’s no “How to Program an Enigma Machine in C#” book (if anyone reading wants to write that, it’d be great). So, about two years ago, 3D Printers were becoming more reasonable for home use. I backed one that came up on Kickstarter for $200 thinking that it was a price I was willing to pay to experiment with 3D printing, and — like many Kickstarter efforts that greatly blow past their funding goals — it failed spectacularly. While I was one of the few backers to actually get a printer, the quality on it was pretty abysmal — but it did show me that 3D printing had some cool possibilities as soon as I printed a Brio track adapter for Oliver. I sold it on eBay for $50, and then ordered a Prusa i3 MK2S. Quite a bit more than I originally planned to spend, but I saw a future in it. To justify my expense after-the-fact (yep), I needed a project. I’ve always been fascinated by the Enigma. A few years ago, I actually researched what it would take to buy one from a private owner — tens of thousands of dollars. They’re cool, but I just wouldn’t be able to justify that for obvious reasons. I searched online on Thingiverse and other sites, and found a few Enigma examples — but nothing that was accurate. Sure, I could have a 50% accurate model, but I wanted more. I then made the decision that if I was going to learn how to 3D print, I might as well learn to do 3D modelling as well. This began my journey. Posted bymarius February 1, 2018 January 31, 2018 Posted in3D Printing, EnigmaTags: enigmaLeave a comment on Why print an Enigma machine? Well, hello there fine people of the internet. It’s been a bit over 6 years since my last post; nearly 9 years since my last post that wasn’t really a situation update on the blog. But now I have a new project that will take a while to complete, and something that might be of remote interest to readers. I’m making an Enigma machine. For as long as I can remember, I’ve held a fascination with the Enigma machine. With the rise of 3D printing, I’ve realized I can have a full-size one in plastic. USB HID Keyboard interface to it?